Jerusalem, Israel — August 15, 2018 … Israeli Minister of Economy and Industry, Eli Cohen has announced that a joint program launched by the Israel Innovation Authority and the Cyber Directorate will ensure that Israel continues to meet the cyber sector’s biggest challenges, secure Israel’s place at the forefront of innovation and bolster Israel’s global leadership in this critical industry. “This program expresses the government’s ongoing commitment to preserving and strengthening Israel’s global cyber leadership, one of the most significant engines of the hi-tech industry’s growth,” said Director General of the Israel National Cyber Directorate, Yigal Unna. 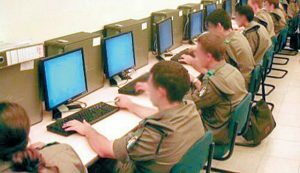 Israel has become a cyber security powerhouse at the center of an $82 billion industry (not counting spending on internal security staff and processes). In addition to collaborating with super-powers, Israel is assisting smaller nations (e.g., Singapore), creating 300+ cyber security startups, exporting last year $6.5 billion in cybersecurity products, convincing more than 30 multinationals to open local R&D centers, and attracting foreign investors. “In 2016, we had about 20% of the global private cyber security investment,” said Prime Minister Netanyahu. The Israeli program consists of three parts: investment in technologies with “gamechanger” potential on a global level; funding support for companies moving from the development stage to the testing and demonstration stage; and the allocation of resources to CyberSpark. Support for long-term, groundbreaking R&D – A program intended to support the development of technologies with significant potential to influence the global market, with the aim of establishing additional foundations upon which Israel’s cyber industry can build in the future. This program is intended for Israeli cyber technology companies that deal with high-risk R&D. As part of the program, companies can receive up to 66% of their R&D expenditure for a given project, and up to NIS 5 million per year for the project. Up to 30 percent financing for a program with an approved budget of up to NIS 1 million for a single pilot in Israel. Up to 50 percent financing for a program with an approved budget of up to NIS 1.5 million for a single pilot outside Israel. Up to 50 percent financing for a program with an approved budget of up to NIS 2.5 million for two pilots outside Israel. The program is intended for Israeli cyber technology companies who have developed a product and or service that has not yet been launched in Israel and is still undergoing development. In terms of technology readiness level (TRL), the program aims to promote cyber companies with a TRL of 4/5 (validation in laboratory) to a level of TRL 7/8 (actual system qualified through test and demonstration). In addition, the Israel National Cyber Directorate and the Israel Innovation Authority will jointly promote the creation of innovation arenas in sectors undergoing significant digital transformations that expose them to cyber threats (e.g. health, transportation, finance, etc.). The innovation arenas will convene international industrial players, regulators, academics, and Israel’s cyber industry to create solutions for tomorrow’s cyber challenges and preserve Israel’s global cyber leadership. The new programs are designed to encourage the creation and growth of whole, sustainable cyber companies in Israel through the promotion, development, and commercialization of innovative technological solutions. This program is an additional tier of the new support programs offered by the Israel Innovation Authority in cooperation with government ministries and other agencies, which already include support for pilot programs in environmental protection, health, and transportation. “The local cyber ecosystem is very developed and wins acclaim around the world. Despite significant investment from VCs who have expressed faith in the local cyber market, many companies face challenges in finding suitable sites to test their technologies. This new program solves this issue and will significantly accelerate companies’ growth and penetration into the global market,” said Aharon Aharon, CEO of the Israel Innovation Authority. Jerusalem, Israel — August 5, 2018 … A Syrian scientist who was responsible for a research center related to the development of chemical weapons was killed in a car accident, according to Syrian reports early Sunday. 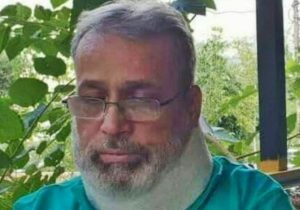 Aziz Azbar, the head of the Syrian Scientific Research and Studies Center in Masyaf, died along with his driver Saturday night. The deaths were reported by several Syrian and Lebanese news outlets as well as the UK-based Syrian Observatory for Human Rights war monitor and a Facebook page purportedly linked to the Syrian military. Asber’s death was claimed by a Syrian rebel group affiliated to Tahrir al-Sham. It includes the group formerly known as the Nusra Front, which served as al Qaeda’s Syrian branch. The Abu Amara Brigades released a statement on their Telegram online channel that said they “planted explosive devices” which detonated and killed Asber. Azbar was close to both Syrian President Bashar Assad and the Iranian regime, which was thought to be using the facility for arms development, according to the observatory. The Scientific Research and Studies Center in Masyaf, also known by its French acronym CERS, has been the target of at least two reported air attacks blamed on Israel, including one in late April said to have killed a number of Iranians. Western security and defense officials have long associated CERS with the production of chemical weapons. Reports have also indicated an Iranian missile operation at the site. Israel never comments on reports of airstrikes in Syria but has stated it would work to keep advanced weapons out of terrorists’ hands and has vowed to stop Iran from gaining a military presence in the country. 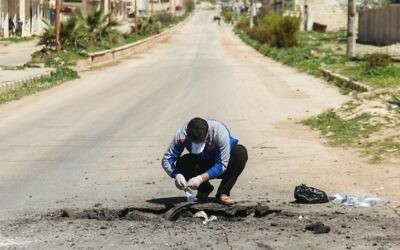 A Syrian man collects samples from the site of a suspected toxic gas attack in Khan Sheikhoun, in Syria’s northwestern Idlib province. Photo: AFP/Omar Haj KadourIn April 2017, the US placed sanctions on hundreds of CERS employees following a chemical attack on the Syrian rebel-held city of Khan Sheikhoun that murdered dozens of civilians, including children. Another CERS facility near Damascus was bombed by US, British and French forces in April after another chemical attack. Syria has been accused of dozens of CW gas attacks that have killed hundreds of civilians during the war, even after it said it was giving up its stockpile. A senior member of the Syrian opposition, citing security officials still working for the regime at the time, told The Times of Israel in 2014 that Assad’s forces were stockpiling chemical substances and missiles carrying chemical warheads at the site, which was not made available to international inspectors tasked with ensuring the destruction of the weapons. Iran’s Press TV blames Israel for Asbar’s death. It noted that on July 22, the Masyaf facility was struck by a missile, which it also blamed on Israel. “Dr. Isbir was not present at the site,” Press TV claimed. How they would know that is unclear, unless of course members of the scientist’s staff told the Iranians or pro-Iranian media these details. In 2012, Iranian scientist Mostafa Roshan was killed when his Peugot 405 was blown up in Tehran. He was a deputy director of a unit at the Natanz uranium enrichment center and Hezbollah commander Imad Mughniyah was killed in a car bomb in 2008 in Damascus.